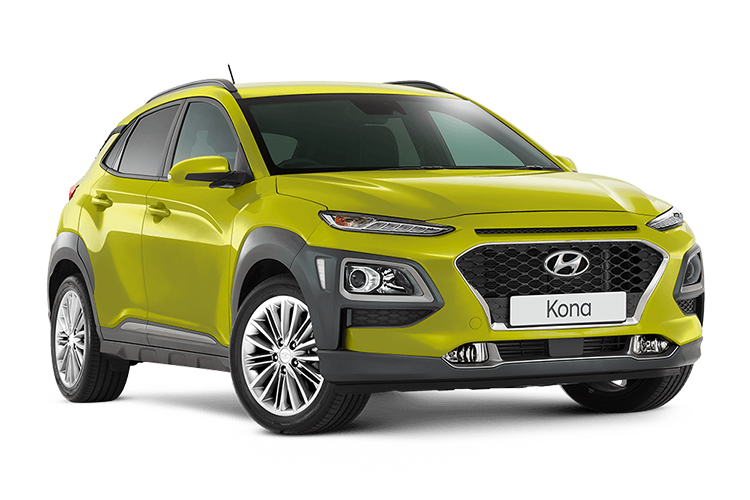 It’s all about freedom of choice, and the Kona gives you the freedom to choose how you present you (and your individuality) to the world. With a variety of colour combinations, you’ll be able to style it your way in order to live a more vibrant life. Available on the Active, Elite & Highlander variants. Available on the Highlander variant with body coloured roof. 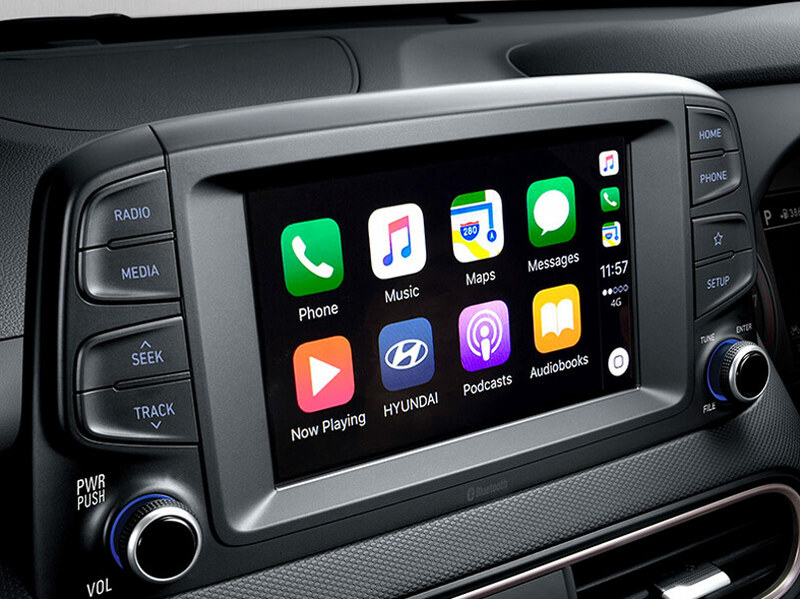 1Apple CarPlay™ functionality requires software update. 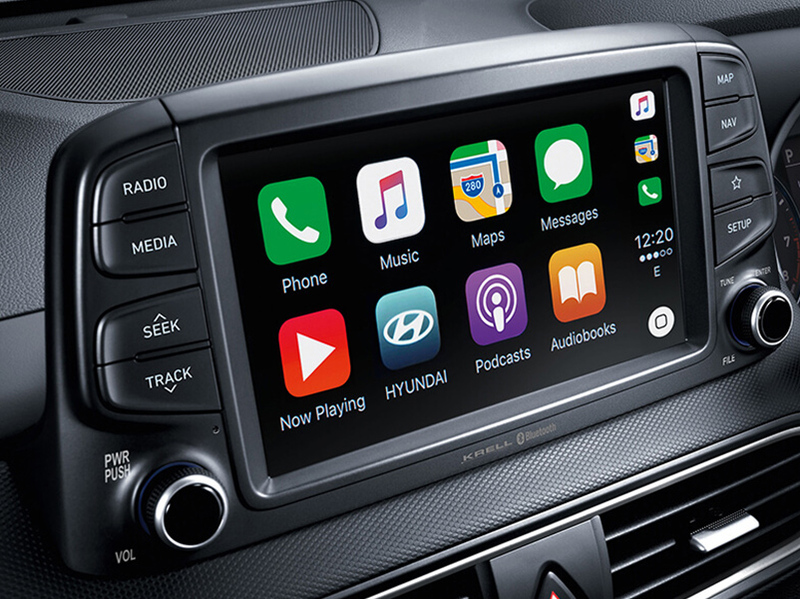 Apple Carplay™ requires iPhone 5® or subsequent model (lightning cable) in order to operate. iPhone® is a registered trademark of Apple Inc.2Android™ Auto requires a device with Android 5.0 operating system or subsequent version, and USB cable in order to operate. Android is a trademark of Google Inc. Highlander variant shown. Two tone roof colours – Dark Knight & Phantom Black. There’s no limit to individuality in the Kona. With its sleek roofline and unique two-tone roof option, you can customise your Kona with a Dark Knight or Phantom Black roof. 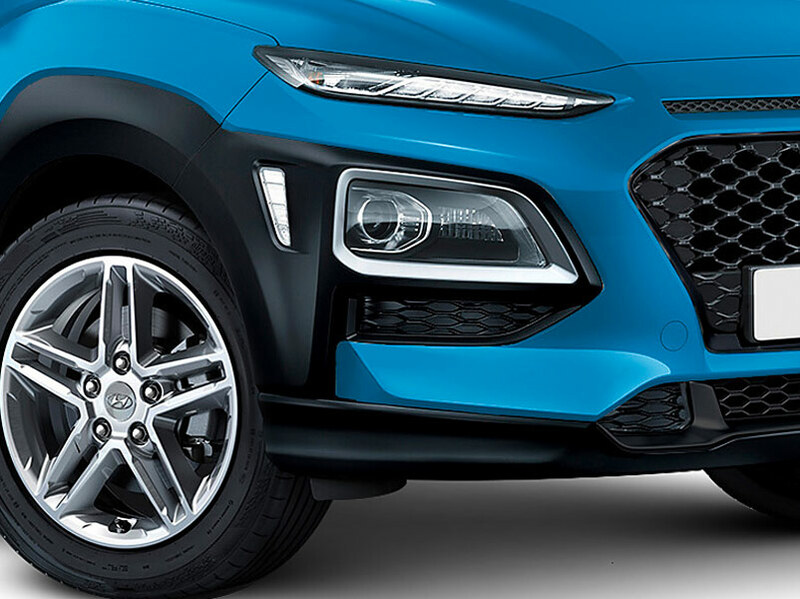 Designed to complement this compact SUV’s vibrant exterior colour options, it’s a combination that guarantees you’ll stand out from every angle. Only available on the Elite & Highlander variants. 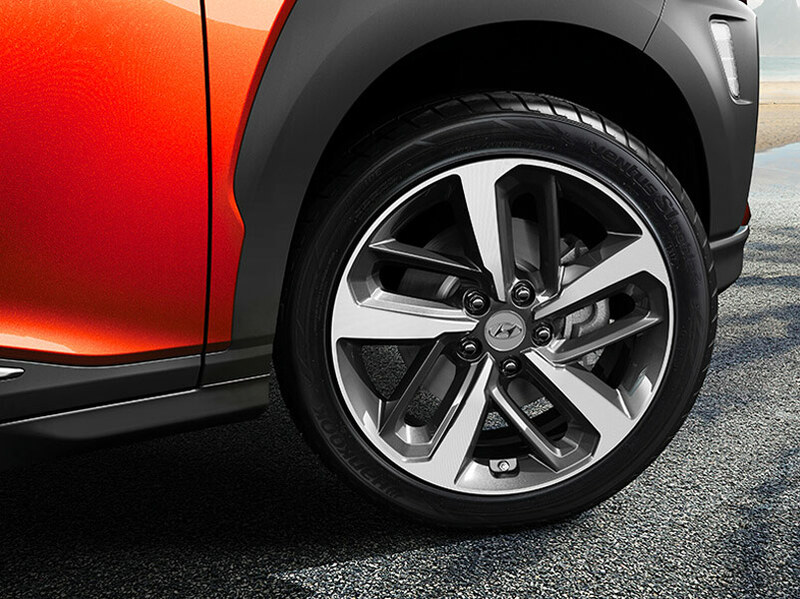 The Kona’s dynamic range of alloy wheels are designed to reinforce its sporty, commanding presence. 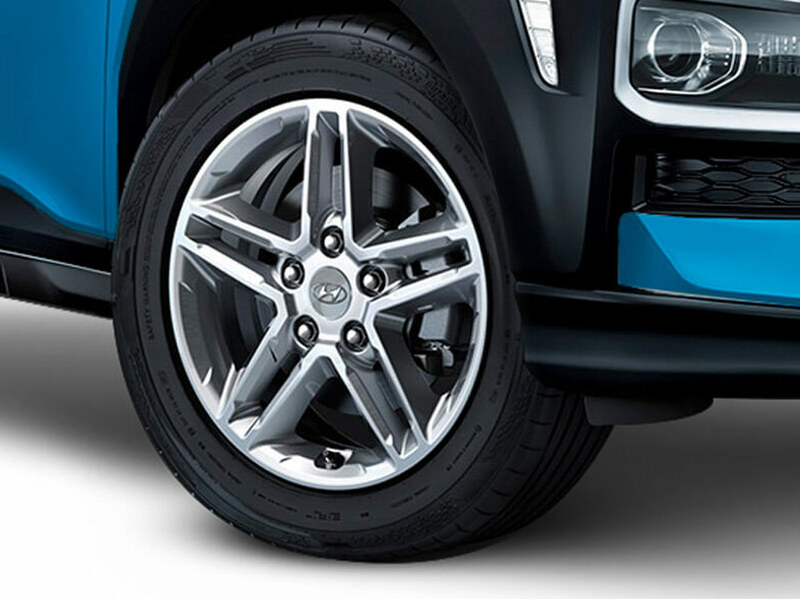 Whether you choose the 16” or 17” styles, or the eye-catching, largest-in-class 18” black machined finished alloys, you can be sure you’re rolling in style. 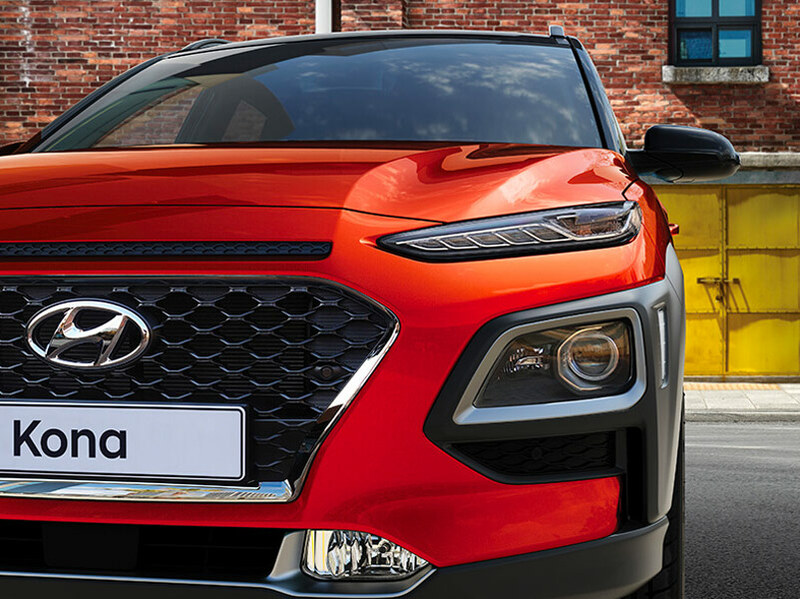 With black, Acid Yellow and red interior trim colour options (only available on the Elite and Highlander variants) you can style to suit, you’re able to create a Kona interior that’s not only practical, but is a joy to be in. 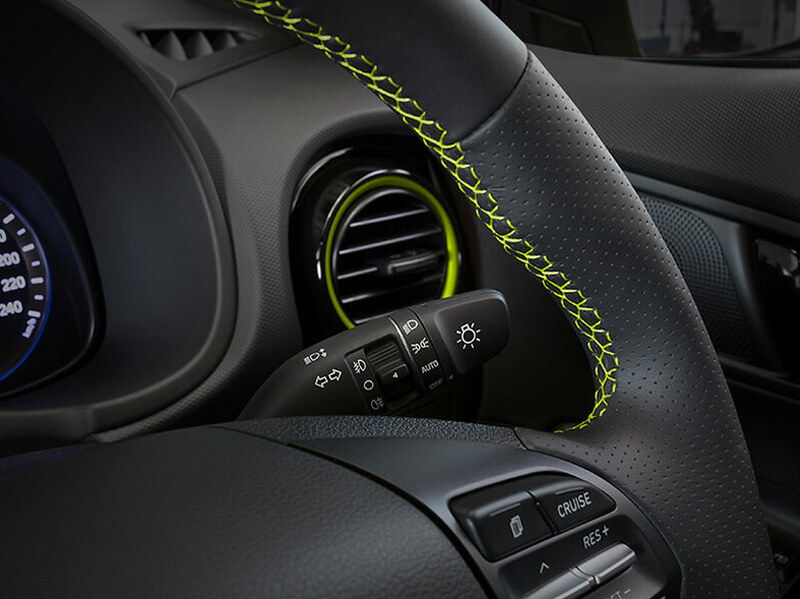 Leather appointed interior – steering wheel, seats & gear knob. 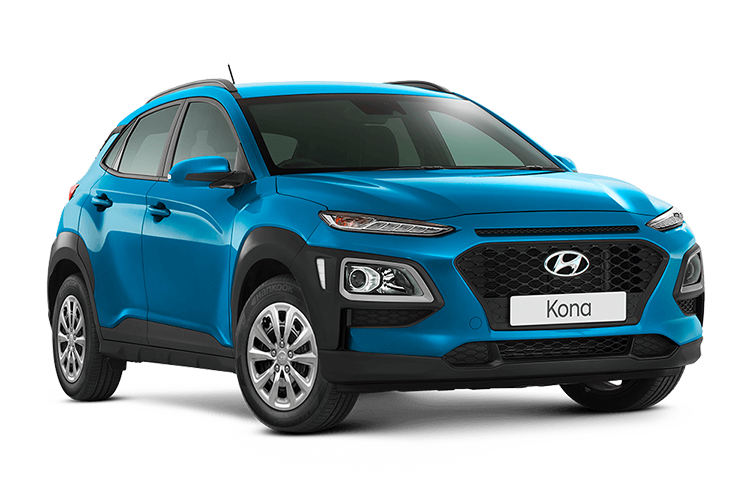 Step inside the Kona, and its premium feel will strike you immediately. 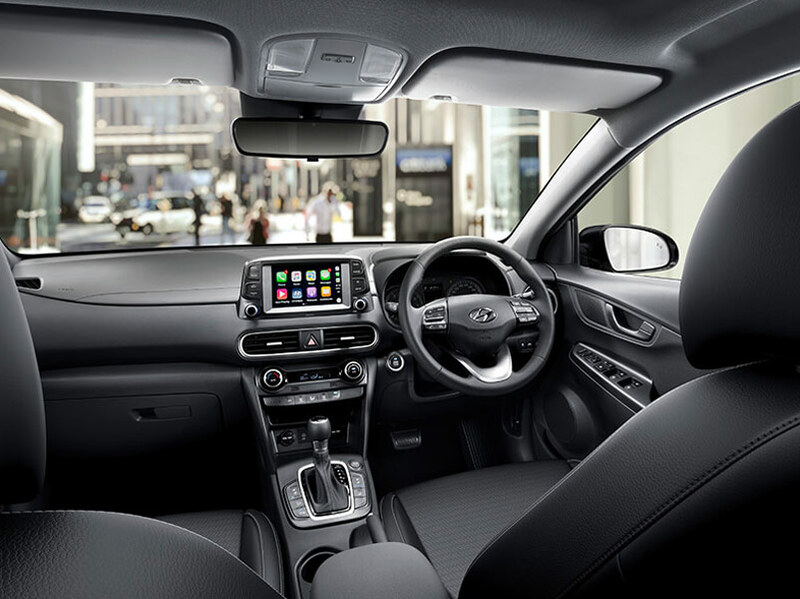 With leather-appointed1 steering wheel, seats and gear knob, you can immerse yourself in high quality materials wherever you venture. Only available on the Highlander variant. 1Leather appointed may contain elements of genuine leather, polyurethane leather (leather substitute) or man-made materials, or a combination thereof. It’s a big world, and even bigger in a Kona. The wide interior design magnifies the sense of spaciousness in every seat, the reduced A-pillar width gives a greater sense of openness, while maximum luggage space gives you the freedom to head wherever your heart takes you. 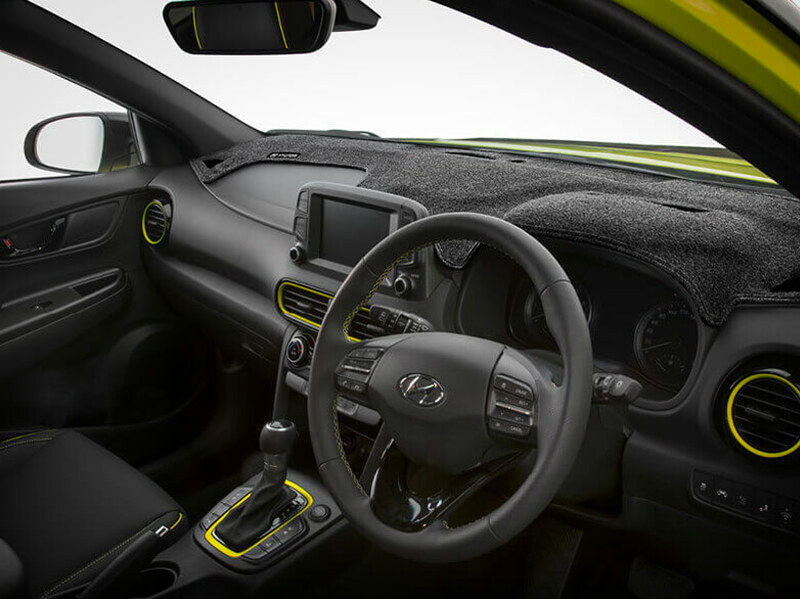 1Interior colour trim options vary depending on variant. 2Leather appointed may contain elements of genuine leather, polyurethane leather (leather substitute) or man-made materials, or a combination thereof. 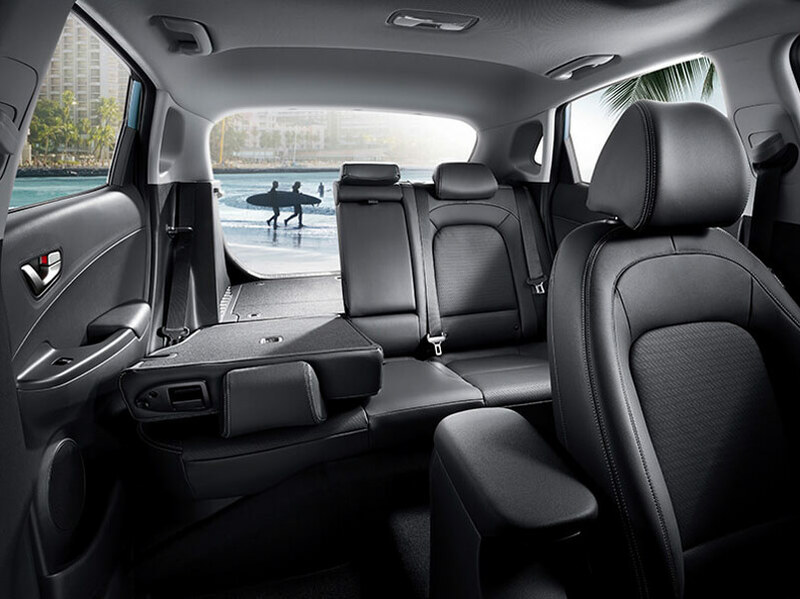 Leather seats not available on the Active variants. In today’s busy world, nothing’s more important than keeping your eyes on the road ahead. 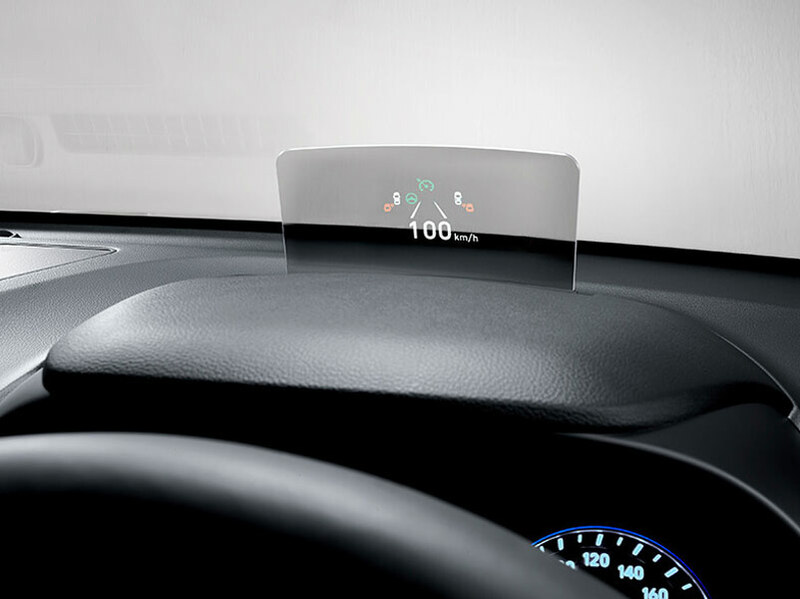 That’s why the Kona introduces a Head-Up Display. 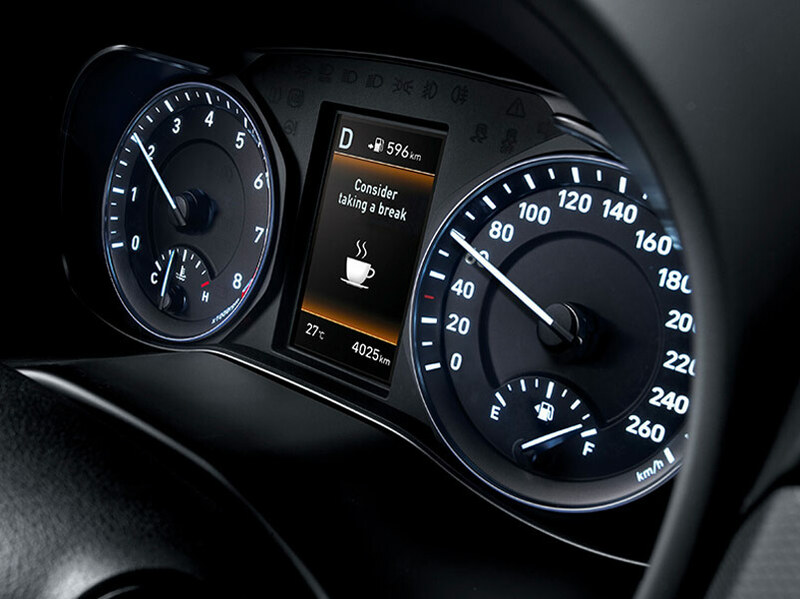 This advanced display minimises driver distraction by projecting key driving data like your speed on the glass panel above the instrument cluster. 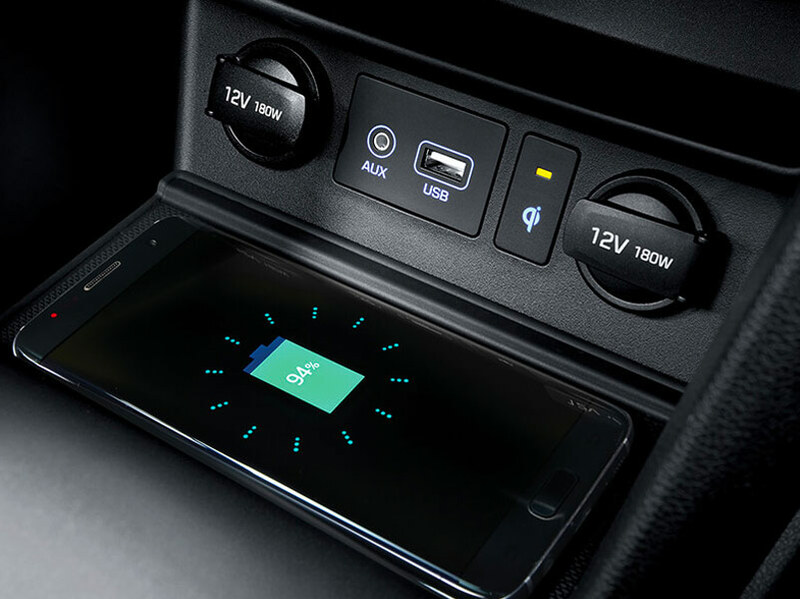 You’ll also find a wireless smartphone charging pad4 in the centre console, so you’ll always be able to easily recharge without the need for cables. 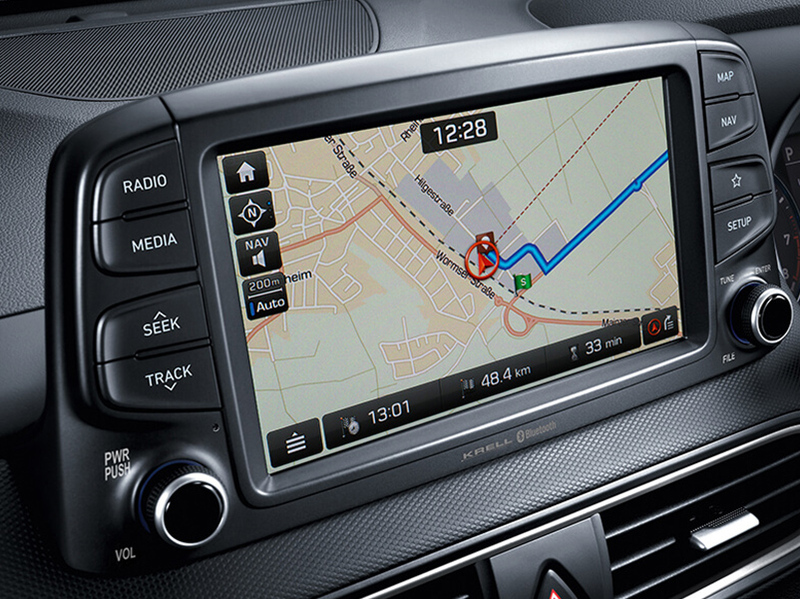 7” multimedia touchscreen display with Apple CarPlay™ and Android™ Auto. 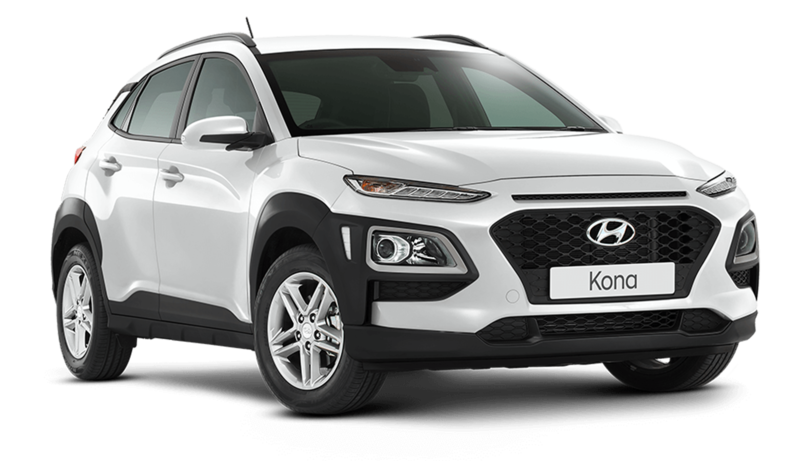 The 7-inch touchscreen in the Kona brings the crispest, clearest detail into the cabin and enables full smartphone connectivity with Apple Car Play™1 and Android™ Auto2. Standard across all variants, this means a range of your smartphone features including calls, messaging, and directions to your next destination via your Maps App can be accessed through this system. A simpler way to get started. 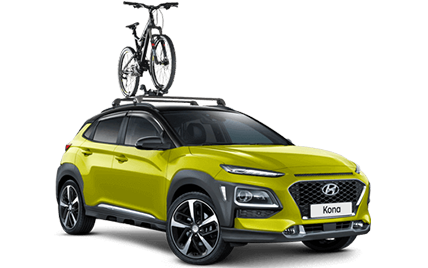 With the Kona, the days of fumbling for your keys are well and truly over. 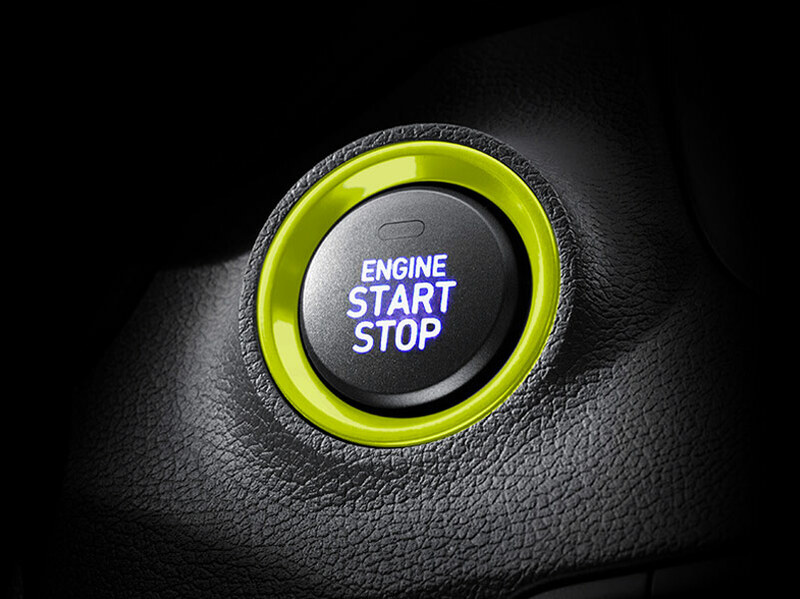 Push button ignition allows you to turn this compact SUV on and off at the touch of the button – without having to take your keys from your bag or pocket. 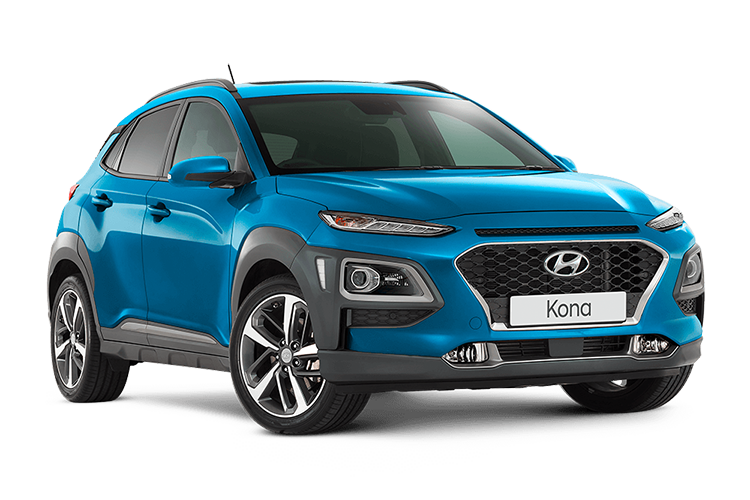 Faster, easier and smarter, it’s another way the Kona is using technology to change the way you move. 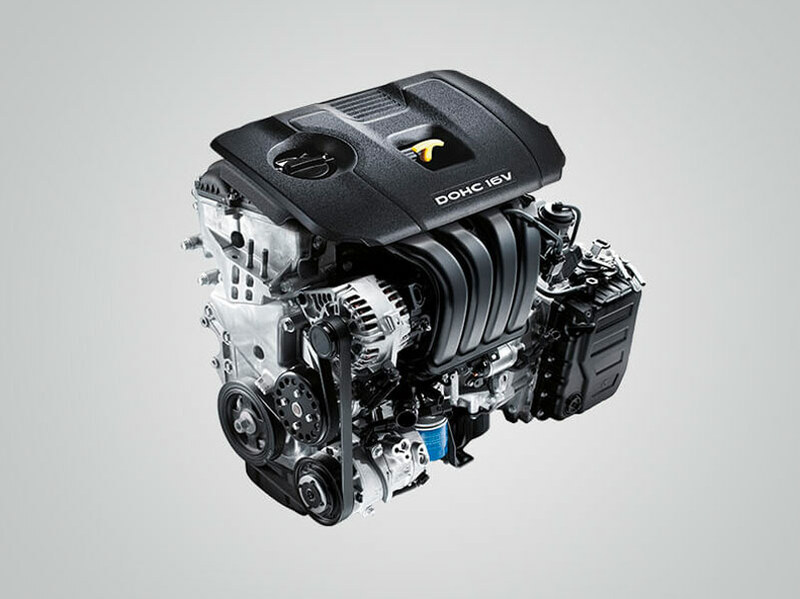 The Gamma 1.6 Turbo-GDi engine uses a mixed-flow turbocharger that delivers sharp throttle response, impressive low-end torque, as well as surprising fuel economy. 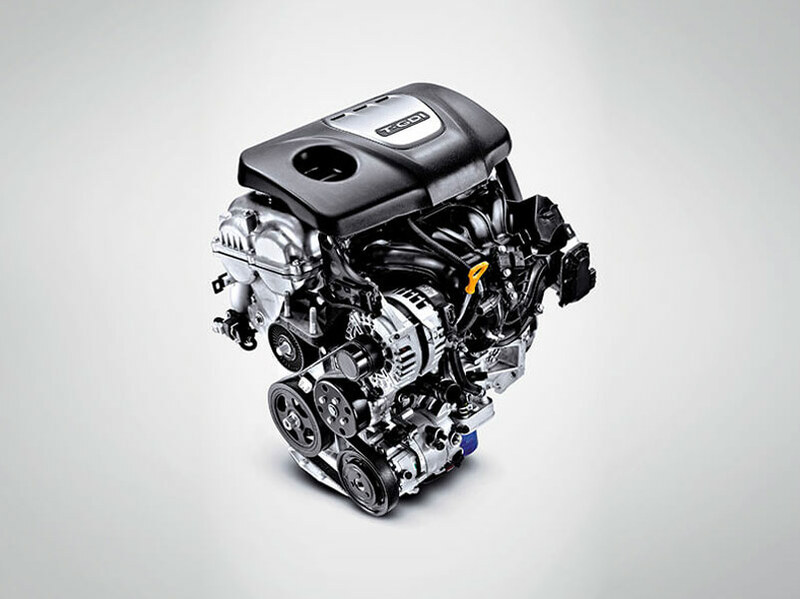 With an impressive output of 130 kW of power and 265 Nm of torque available over a wide 1,500 rpm – 4,500 rpm torque band, the Gamma 1.6 T-GDi offers 18% more power and 47% more torque than the 2.0 MPi engine. 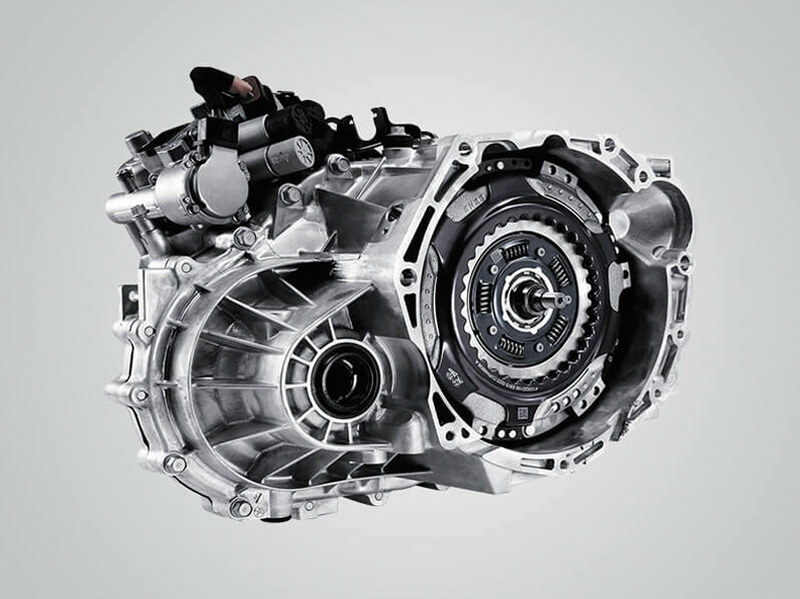 Available with the Nu 2.0 MPi engine, the 6-speed automatic utilises a compact, lightweight design with a multi-plate clutch torque converter for improved fuel efficiency. 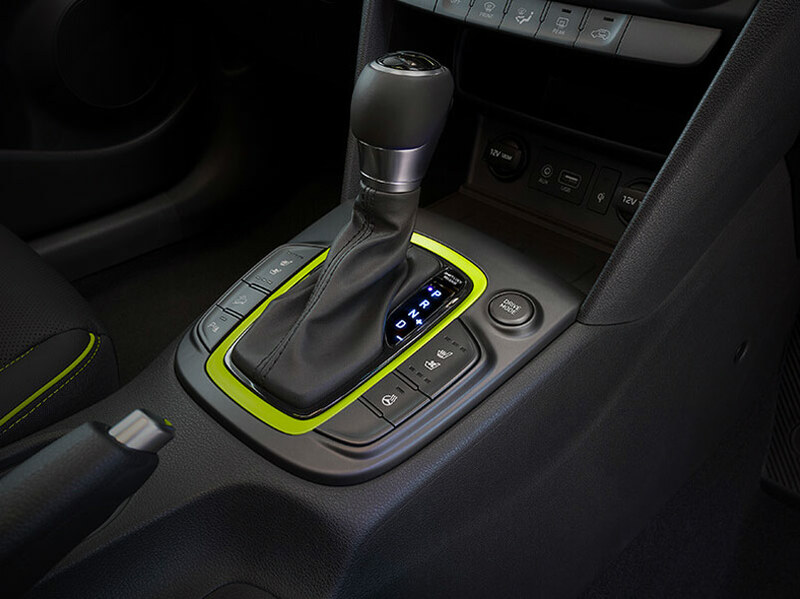 For a sporty driving experience, a sequential manual mode is also available, and is activated via the gear lever. 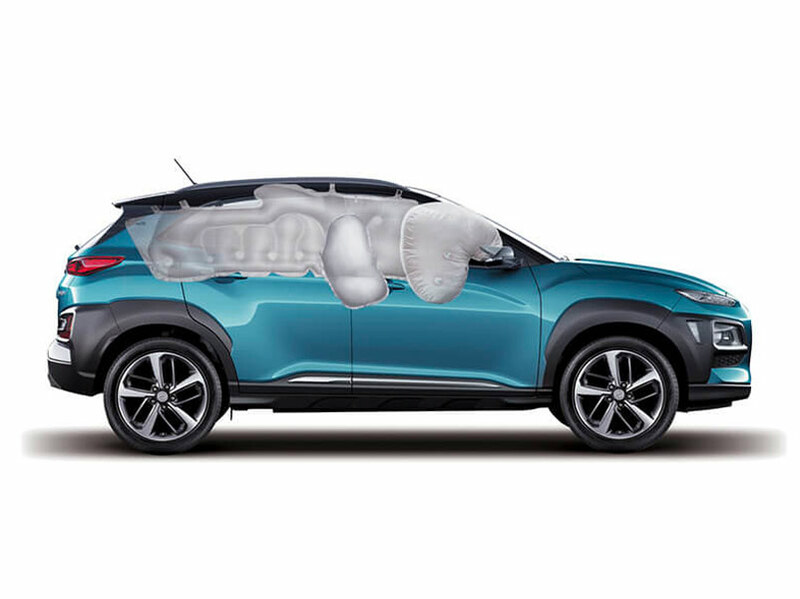 The Kona features a comprehensive suite of airbags, including dual front airbags (driver & front passenger), front side thorax airbags (driver & front passenger) and side curtain airbags (1st & 2nd row). Tyre Pressure Monitoring System (TPMS). 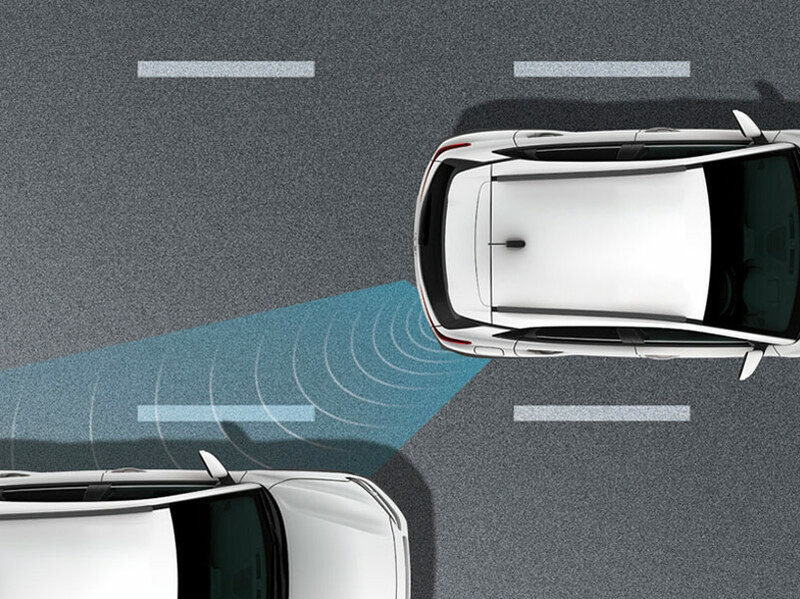 A driver protection feature which helps monitor driving patterns in order to detect reckless or fatigued driving and prevent potential accidents. The system analyses various vehicle signals such as steering angle, steering torque, vehicle's positioning in the lane and driving time. If the system detects inattentive driving patterns, an audible sound and message on the display panel will bring this to the driver’s attention. Only available on the Active with safety, Elite & Highlander variants. Tailored carpet floor mats (Set of 4) – Yellow stitching. 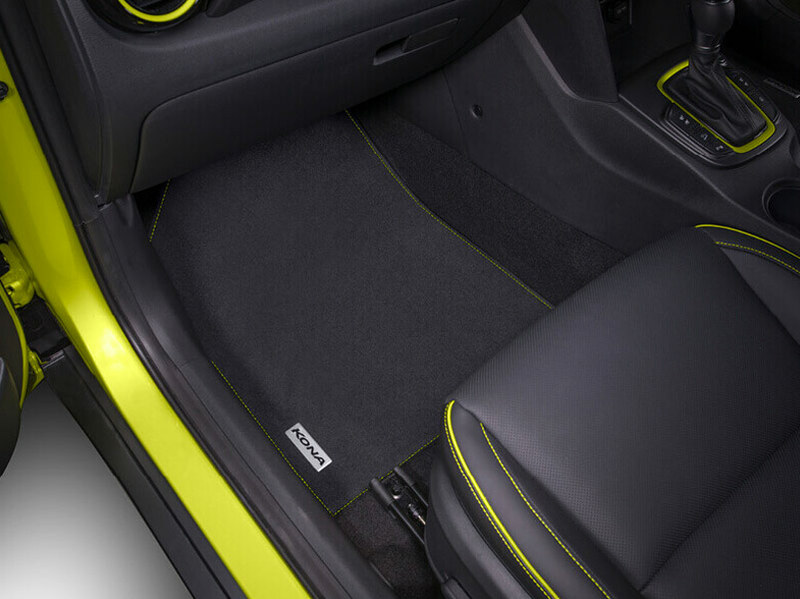 The tailored carpet floor mats are custom designed to suit your Kona’s interior trim stitching. Combining high quality nylon pile and a synthetic rubber non-slip backing, mat sets feature the added driver safety of mat locating clips. They are manufactured to meet specific automotive test standards covering durability, shrinkage, UV stability and colour fastness. 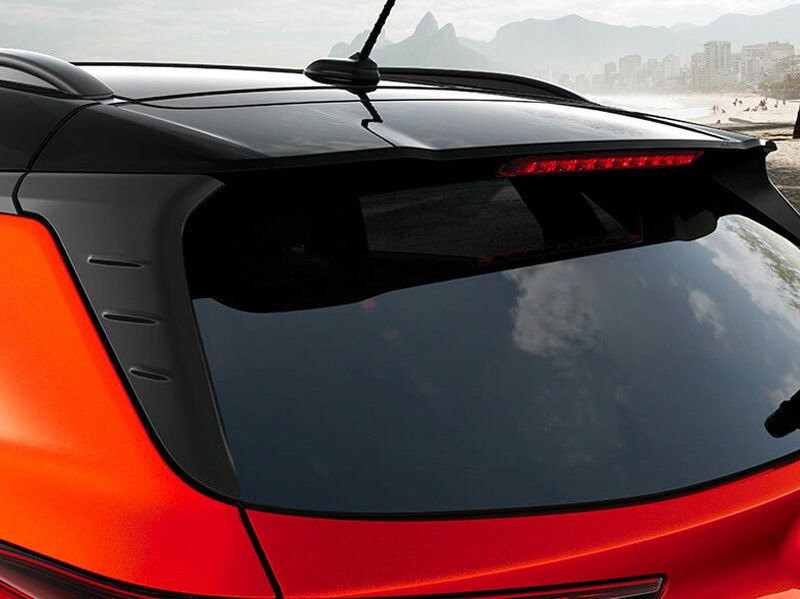 Smart and sleek laser shades fit your Kona's rear windows to help keep out the sun’s UV rays and protect your passengers and upholstery from excess light and heat. 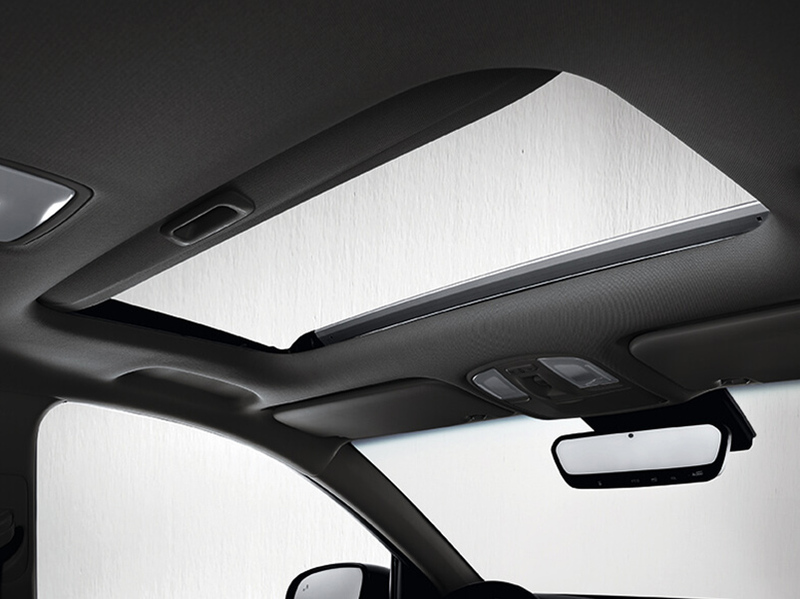 Mounted clips keep the shades securely in place even when the window is down. 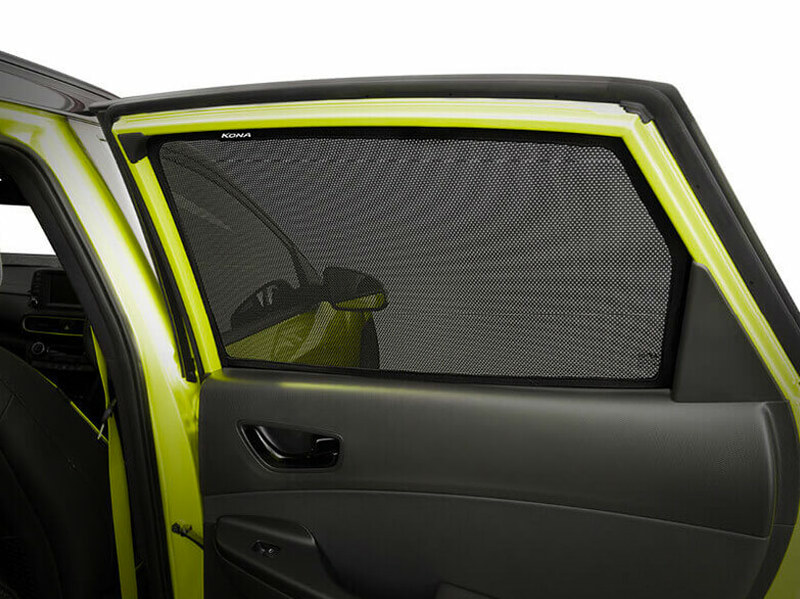 Moulded to the exact dimensions and contours of your Kona's dash top, the dash mat fits easily with Velcro tabs, is UV-stabilised and holds its shape without the need for hard backing. 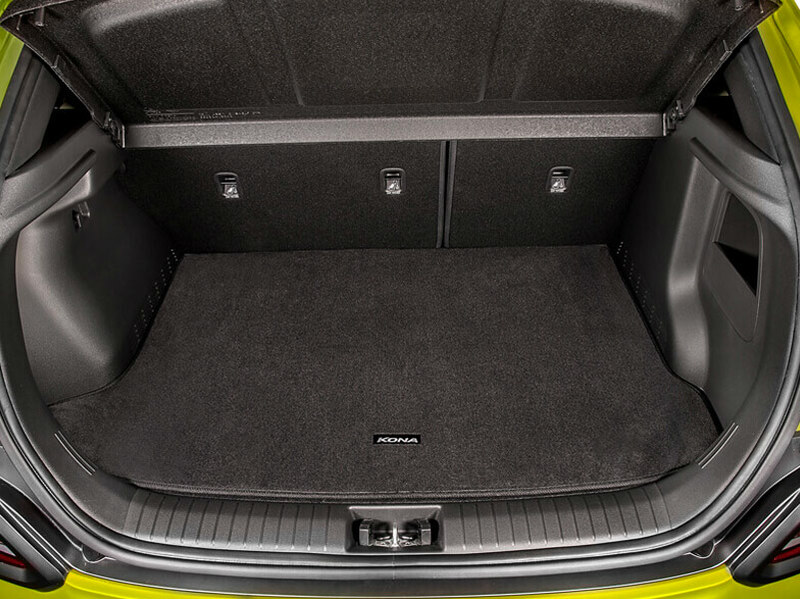 The tailored carpet cargo liners are custom designed to suit your Kona. Combining high quality nylon pile and a synthetic rubber non-slip backing. They are manufactured to meet specific automotive test standards covering durability, shrinkage, UV stability and colour fastness.